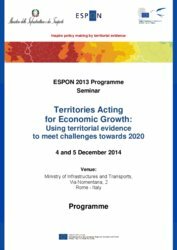 This seminar in Rome focused on ESPON 2013 Programme results in relation to thematic priorities of the Trio of EU Presidency countries, Italy, Latvia and Luxembourg. The seminar addressed themes and integrated approaches that can stimulate territories, regions and cities in providing the necessary contributions to economic growth. 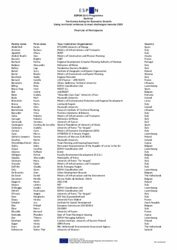 In doing so, it also looked towards the long term future of the European territory. The event was organised in cooperation with the Italian Presidency of the Council of the European Union. Promote territories as actors for economic growth and the use of integrated territorial strategies. Discuss new solutions for re-balancing territorial development trends to the benefit of inner areas making them more productive places, also supported by closer rural-urban partnership and use of natural and cultural heritage assets. Discuss ways of making towns more dynamic, attractive and competitive and more accessible while still maintaining their identity and endogenous characters. 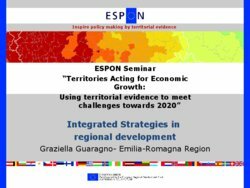 Present and discuss the latest results of ESPON, including territorial vision and scenarios 2050, regional resilience, poverty and social exclusion, and new ESPON toolbox developments. 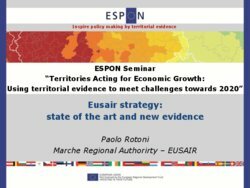 Consider ways of enlarging the outreach and uptake of ESPON results in policy at different levels based on experiences from transnational capitalisation efforts by ESPON. 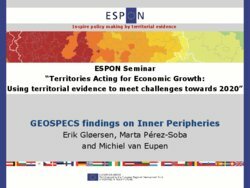 The seminar provided a unique opportunity for networking and for actors and decision makers at different administrative levels to engage with researchers and experts in reflections on further uptake of territorial evidence in policy development, and on demands for evidence and activities that could be covered by the ESPON 2020 Programme. The morning of the first day focused in two plenary sessions on the important themes of high interest to the European policy development. The first plenary session addressed the challenge of counteracting impacts of the crisis by territories acting for economic growth. The second session focused on the themes of inner areas and towns posing the questions of relevant investments and use of integrated strategies. In the afternoon of the first day six parallel workshops were arranged in two rounds. 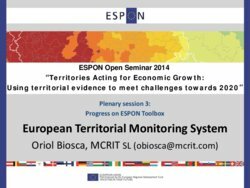 The workshops took up issues raised in the plenary sessions and crossed them with the relevant ESPON territorial evidence available. In addition, the workshops addressed the latest results from ESPON applied research projects, targeted analyses and scientific platform projects. An important focus in the workshop discussions were key messages useful for policy makers in the context of Cohesion Policy 2014-2020 and in policy development promoting policy orientations of the Territorial Agenda 2020. 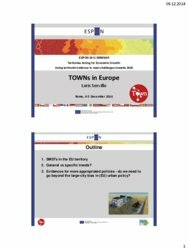 The first three workshops dealt with the practical use of integrated strategies for territories, concrete solutions for inner areas and the future of Europe’s towns. 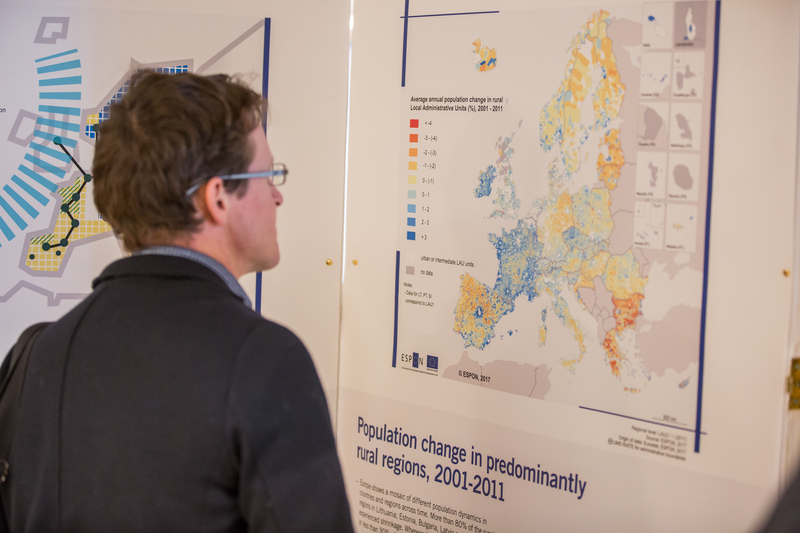 The subsequent three workshops addressed the territorial vision and scenarios 2050, regional resilience and poverty as well as European evidence for territorial cooperation areas such as European macro regions. The second day began with a third plenary session looking into new elements of the ESPON toolbox: the European Territorial Monitoring System and a related, tailor-made monitoring system for the Baltic Sea Region, a web-based application for Territorial Impact Assessment and a screening of the possible use of Big Data by ESPON. Before lunch, a forth plenary session presented experiences and achievements in terms of capitalisation upon ESPON results at the transnational level through efforts made by the ESPON Contact Point Network and discussed how an even wider outreach could become reality in the future. Finally, the seminar closed with an outlook on the ESPON 2020 Programme and the new ESPON EGTC, and closed with presentations of the intentions and timetable for the upcoming Latvian and Luxembourg EU Presidencies before the farewell by the Italian EU Presidency. More than 180 policy makers, stakeholders, practitioners, semi-professionals, scientists and experts attended this event. 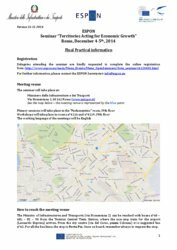 Please find below the programme of the seminar, the list of participants and the presentations made. More pictures on the next page. Contact the ESPON Coordination Unit (info@espon.eu) should you need further information.